Can YOU Survive the Frankenwerepire Challenge? Meet Doctor Voltabolt. He's a GREAT guy... if you enjoy the sound of dentist drills and get your thrills from making heroes scream! Y'know, your all-around dentist-by-day, mad scientist by night. And THIS night, he's got his newest experiment ready to send at you: the Frankenwerepire! You've got to be REALLY dead-icated to win! Ghost Moglinster 2013 pet (only drop off ULTRA Frank! Come back tomorrow for MORE Mogloween! Trick or treating just isn't the same without glowsticks! We've got a ton of new glow-in-the-dark treats in our new Mog-GLOW-ween Merge shop (coming tomorrow), and after you equip them you can /join glowmap to play in the dark and watch yourself glow! Get your glow on this Mogloween! 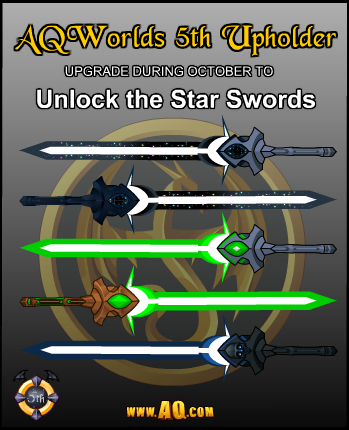 Don't forget: last chance for 5th Upholder! October's almost over! 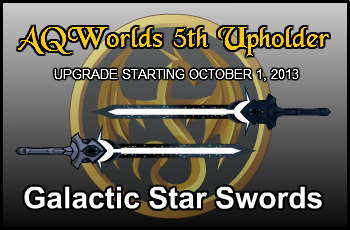 If you want to become a 5th Upholder and gain access to all of our new StarSwords, be sure to upgrade your account before Friday night! Shoot for the Star Swords! Next week: Return to the Mirror Realm! Luck of the Draw Wheel of Doom contest! Swordhaven Chaos Saga finished last week! Pumpkin Contest 2013 ends next week! Don't miss all the other Mogloween goodies, quests, and battles in Mystcroft! 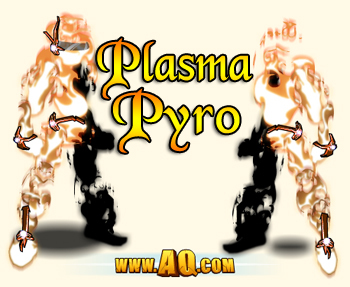 Plasma Pyro should totally be rare, right? Obviously it's freakin' gorgeous, so we don't want to remove it from the game entirely. And we definitely want to give those of you who might have used a slightly-delayed payment method a chance to get this great set. However, we do need to limit the number of people who have it, for lag-management reasons. So the set will remain in game until Friday, at which point it will go rare. And on the bright side (heh, bright), all of you Arklen fans who bought it will be the proud owners of a very limited, very prestigious set. Good compromise? PS: the Chaos War rare gear leaves this Friday! Don't miss out on some of this great gear. /join chaoswar to battle the Chaorrupted creatures of Lore! Arklen's Hot. REALLY HOT. Like, on FIRE! Just when you thought your favorite day was Friday Release Day… here comes Tuesday taking the spotlight with the Featured Artist Showcase Shop! 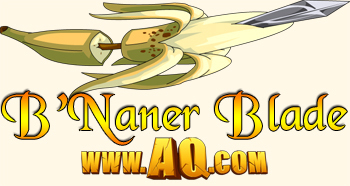 Special Tuesdays throughout the year are dedicated to an AdventureQuest Worlds artist who gets to express his or her creativity by creating unique items for YOU! We have been blessed with the artistic talents of… *a really big deep breath*… Zoshi, Diozz, Tyronius, Aegis, Jemini, Ven, J6, Dage, Mido, Hizu, Nuglath, and myself, *another big breath* aaaand now it’s time for Arklen to ignite the stage. As much as you’d love to learn more about Arklen as a person, you’re probably a bit more excited about the items in his shop. And for good reason, too—Arklen conjured up some of the HOTTEST items we have ever seen! Starting at 5pm Sever Time, open your Game Menu and claim your favorite Arklen items from the Featured Artist Shop! You can also speak with Arklen in Battlecon to access his hot stuff. Due to insane inferno animations, the items in Arklen’s Shop will be Legend-Only, OR you can use AdventureCoins instead! If you haven’t already become an Upgraded Legend, then this is the PERFECT time to Upgrade your Membership because the LAST day for 5th Upholders is Thursday, October 31. Click here to become a Legend now! Additionally, we are running a special on AdventureCoins: 10% More AdventureCoins when you buy with a Credit Card. 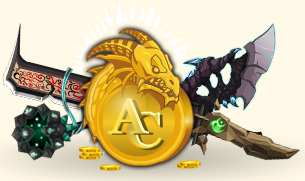 Click here to order your AdventureCoins bundle and receive 10% more ACs! Arklen’s adventures began 10 years ago when he started playing the original AdventureQuest—it was the only Flash RPG back then! After scoring some animation software, Arklen created a magical floating turtle that shot a blue water blob at its enemies. When Captain Rhubarb and Galanoth caught sight of this reptilian rascal, they invited the intrepid animator to join the Artix Entertainment family. For as long as he can remember, Arklen always liked drawing. Japanese TV shows made drawing seem a little more accessible, and his immensely more talented friend kept him motivated. Arklen calls himself an Animator first and an Artist second. He’s been focusing on effects animation (hence the Plasma Pyro armor set), but character animation is close behind. To this day, Arklen continues to animate and is leveling up his artist abilities with the help of the AE community! Not only has Arklen traveled across AdventureQuest Worlds, but also all across the real-world; he’s found artistic inspiration in Poland, London, Los Angeles, New York, and San Francisco. Arklen also loves raviolis, sweet chili, and spaghetti squash. Douse that with red sauce, and he’s in love. Wash it all down with an almond milkshake and Arklen is in heaven! Wowie! Arklen sure is a fascinating fellow. And come later this afternoon, you too will be fascinated by Arklen’s fiery items as you Battle On to victory! It’s a Mogloween Monster Mash-Up! Tricks and treats are headed your way! On October 31, boys and ghouls around the world are dressing up in spooktacular costumes … including a challenge boss monster inside AQWorlds! Oh. My. GoodBadness. Wha…what IS that thing?! And YOU seriously think YOU can defeat that MONSTROSITY?! …AND survive? …better buff those stats and Level Up your Class, because this Mogloween Challenge Boss Fight will be the spookiest one yet! Once upon a time, there was a simple farm boy named Alden. In a land terrorized by an evil King, Alden did the impossible. He raised a sword against the evil King's monsters... then he raised an army... then he united all of the Kingdoms... then he saved the land and freed all the people from the evil King once and for all! (Story begins in the game Bladehaven) They hailed him the good King Alteon. Justly so! He was caring, honest, wise and true good. He loved the people of his Kingdom. To so many heroes of Lore, he was a father figure... a shining beacon of hope. 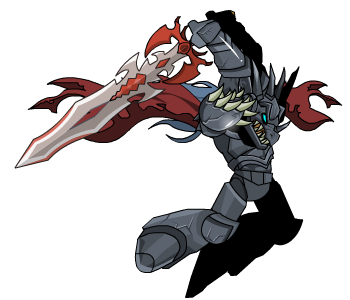 Five years ago (Story of the game DragonFable) King Alteon battled the evil forces of the DoomKnight Sepulchure. But he did not do this alone. He saw great potential in a new hero of the land. King Alteon has always had a good eye for seeing someone's true potential. So it comes as no surprise... he saw your potential the moment you first met him. During the final battle between good and evil (the opening story of AdventureQuest Worlds) King Alteon and Sepulchure squared off to personally finish their battle once and for all. But the fight was inturrupted by two very unusual people; The ChaosLord Drakath... and you. 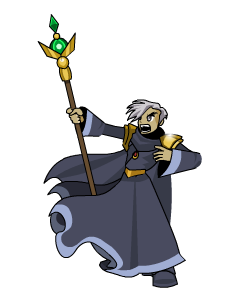 We did not understand at the time what Chaos was, but Drakath had obtained godlike powers. He slew Sepulchure and mortally wounded King Alteon.... leaving him infected with the chaos. It was truely a Kingdom in Chaos. But King Alteon was no ordinary man, he did not succumb to the infection and wisely knew there was only one way to save the land from Drakath. The land needed to be united... a truce must be forged between the forces of Good and Evil. So he choose you, to travel to the fallen undead flying castle of Shadowfall and convince Gravelyn, the leader of the evil foces to take part in the truce. A bold move considering Gravelyn is the daughter of his former arch-enemy, Sepulchure. You did the impossible and the truce was losely formed. So, just as King Alteon had united the land against that evil King a long time ago, you had now united the land against the ChaosLord Drakath. (I told you King Alteon had a good eye for heroes.) In the great adventures that followed, King Alteon always had the answers. He always knew the right thing to do. Alas, it was only a matter of time before the Chaos finally overtook him. King Alteon knew this day would inevitably come. That is why he selected you... he selected you to do what is right, and save the world from what is coming next. You are now our only hope. We must defeat the second lord of chaos "The Twins" and then face Drakath himself! In absolute darkness, even the flicker of a candle is a blinding beacon of hope. Face the Chaos Beast AND Chaos King Alteon! Take on the 3-headed Chaos Dragon AND confront Chaos King Alteon TONIGHT in the 12th Chaos Saga finale! Will you slay Chaos King Alteon... or spare him? And what will be the cost of your decision? As Swordhaven falls, Chaos flames rise high; life in Swordhaven will NEVER be the same! Chaos rises and Swordhaven falls! Your battle will begin on top of Swordhaven's castle as you tackle the Chaos Beast while Lady Celestia watches. Then, race through a burning Swordhaven while Choas King Alteon flees his fate... and more destruction of the home he once loved. Investment Trinkets are items which sell back for MORE AdventureCoins than the 1000 ACs you bought them for! There are two versions: Legend AC and and regular AC Investment Trinket. After the shop leaves, the trinket's sell-back price will change to 1500 ACs for the Legend Trinket and 1250 for the regular Trinket. Do NOT sell the trinket before we announce it's time or you will not get the new sell-back price. Oracle Class for 1 Million Facebook Likes is LIVE! 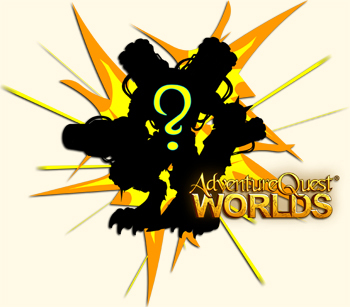 We promised you a special class if AQWorlds reached 1 million likes on Facebook, and it's finally happened! After much thought and extensive testing, we are ready to unleash our gift to you upon our servers. Are you ready for it? I see all - everything you post on your wall. Find Memet's Oracle Class skills writeup here, and make sure to get yours this weekend! The Class is 0 ACs and will be permanently available as our thanks to you for helping us reach our goal! Luck of the Draw Event in the Carnival of Fortune! Fate and Fortune wait for you at the Carnival as we begin our Luck of the Draw event! 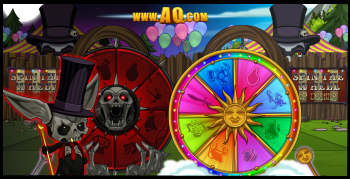 Click on the Wheel of Destiny in Battleon to head to the Carnival of Fortune. What rewards do the wheels have for you? 1st prize is Dage the Evil's Fallen Warlord armor set (only one copy ever made, concept sketch below), with 1000 additional prizes available! Read the Design Notes for details! The Livestream shop in BattleCon leaves Friday, 11/1! Confront Xing and Xang's Chaos Beast... and the 2nd Lord of Chaos! Enter the Realm of Chaos and begin your journey to confront Drakath! My vacation starts tonight. See you all on Thursday for the Frenkenwerepire Challenge! Be nice to Memet, she's in charge. How much harm could one Nightmare Moglin do? Our way of thanking you for showing us so much love, Oracle class will be available to ALL players for 0ACs - so you can even store it in your bank without having to worry about space. 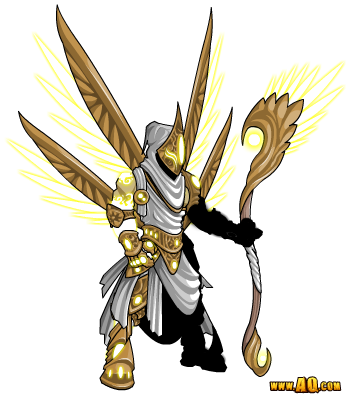 You'll be able to get it tonight from the Oracle Class shop in Battleon. Ready to see what this thing can do? As an Oracle, you're a strong (and clairvoyant!) healer who can gaze into the past, present and future of all of your friends. You're excellent at maintaining the health and status of your friends with your supportive wall posts skills. And of course, you can notify your friends of your enemy's strengths and weaknesses, because you've read everyone's timelines. Oracles regain mana from all hits landed in combat, more if it's a critical strike. The amount of mana regained is based on the amount of damage done relative to their own HP total. The stats you'll want to favor as an Oracle are Intellect, Endurance and Wisdom. A basic attack, taught to all adventurers. 5 mana, 8 second cooldown. Magical. Requires rank 1. Your next auto-attack will be a critical strike. Has a chance to apply Prophet's Vision, increasing Intellect and critical strike damage by 30% for 15 seconds. Your main damage ability. I feel like I should point out that Prophet's Vision lasts for longer than the cooldown, so if you see this pop up, you can hit Foresight again for an extra strong crit. 30 mana, 8 second cooldown. Magical. Requires rank 2. Heals a friend and up to 3 others by placing a random judgment on each based upon their relationship with the Divine. Close Friends: Increases Strength & Intellect by 20% for 20 seconds. Befriended: Strong heal over time for 15 seconds. Divine Acquaintances: Moderate heal over time for 15 seconds. It's Complicated: Reduces damage taken and Luck by 10% for 10 seconds. Unfriended: Increases mana costs by 10% and reduces Endurance by 10% for 10 seconds. Of course "The Divine" is capricious, making the effect you receive completely random. Better hope you don't get Unfriended. 20 mana, 14 second cooldown. Magical. Requires rank 3. Share photographic imagery with a friend of your opponent's next movement. Applies Shared Link, increasing your or your ally's chance to dodge and critically strike significantly for a short duration. If Prophet's Vision is up, and you're the one who gets the buff, this can be especially cool. Wisdom is increased by 20%. All healing is ncreased by 15%. 19 mana, 12 second cooldown. Magical. Requires rank 5. Advanced precognition allows you to read your opponent's timeline and notify allies of his weaknesses. You will either block most of your opponent's Attack Power, or ignore most of your opponent's Spell Power for a short duration. Note that this is also a random effect. You have an equal chance of getting either one regardless of what monster you are fighting. On rare occasions, the Oracle and his entire group are granted Divine Recovery, fully healing them and granting temporary invisibility. As you have probably noticed, this class has a lot of random effects. But they should all be pretty useful no matter what you get (except for Unfriended, hehe), so your ability to be effective doesn't have to depend on getting the right die rolls. On rare occasions the oracle and his entire group are granted Divine Recovery fully healing them and granted temporary invulnerability. 10% More AdventureCoins = 100 Times Better! Gold is good… AdventureCoins are better… and 10% more FREE AdventureCoins is the best! When you buy any AdventureCoins bundle with your Credit Card either in-game or on our website,* you’ll receive 10% more ACs—because we love you that much! Hurry! This sweet offer ends November 2, 2013, so get your AdventureCoins now! * If you buy Artix Points on the Portal, you will get 10% more Artix Points, but will not get 10% more ACs if you buy them with Artix Points. and Hold Up your Star Swords, 5th Upholders! What a wonderful 5th Birthday this has been! The AQWorlds team got to meet all of you at BattleCon, we reached 1 Million Likes on our Facebook Page, we triumphed over BrutalCorn, and thanks to our Legendary 5th Upholders, we can continue to celebrate all month long… and beyond! If you still haven’t become a 5th Upholder… now is your last chance! 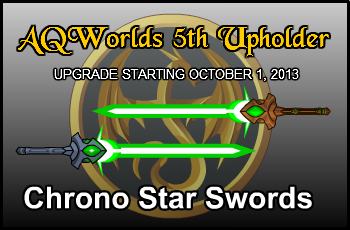 As the clock strikes Midnight on October 31, 2013, you will no longer be able to become a 5th Upholder, forever losing your chance at owning 5 Rare Star Swords. Don’t delay… become a 5th Upholder Legend today! What Does a 5th Upholder Get? When you become a 5th Upholder, you get FIVE Rare Star Swords (marked 0 AdventureCoins so you can store it for free and forever…because we love you that much), a Character Page Achievement Badge, and some serious bragging rights. How Do I Become a 5th Upholder? Super simple: Upgrade your account to become a Legend! If you are ALREADY a Legend and your membership expires ON or AFTER November 1st, 2013, then you're are ALREADY a 5th Upholder. Grats and thanks! If you help support AQW by buying ANY membership ANY TIME during the month of October (from October 1st to October 31st, as long as it expires on or after November 1st) then you become a 5th Upholder! Does My Membership Already Make Me A 5th Upholder? How Can I Check? Easy! Just click the Manage Account link on the left under the ACCOUNT section. How Do I Get My Super Sweet 5th Upholder Swords and Badge? 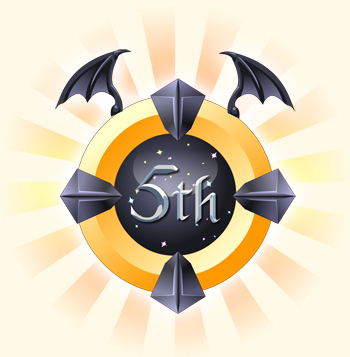 You will find your 5th Upholder Badge in your Book of Lore in the Badges tab. Click on this badge and you will see that it comes with a shop. You will be able to grab your swords from that shop and start showing them off as well as your Character Page Badge. You can use Artix Points on the Portal site or any method in AQW to upgrade, but it MUST be an AQW Membership. AdventureCoins DO NOT COUNT TOWARD 5th Upholder. Absolutely! We couldn't keep AQWorlds running without every single upgrade and AC that you buy. Nearly every penny you spend goes back into the game. Though some people prefer buying AdventureCoins and others prefer upgrading, anyone who spends real money on this game deserves to get as much as we can give them, because without their support... there wouldn't BE an AQWorlds for everyone to play! 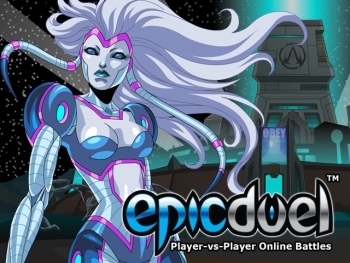 You may not know this but AQW (like all AE games) is ENTIRELY supported by the players. We have no financial backers and nobody owns stock in the company. Clicking on ads and doing AExtras offers does bring in some money, but not nearly enough to keep AQWorlds free for everyone to enjoy. Without everyone who has supported AQWorlds over the years, we wouldn't be able to make these amazing games, or allow anyone on the internet to create an account and begin battling through AQW! I can't imagine having a better job, or better bosses (that's YOU)! Thank you for battling alongside us, and for sharing your ideas and love of AQWorlds with us. You truly are the best gaming community on the internet! 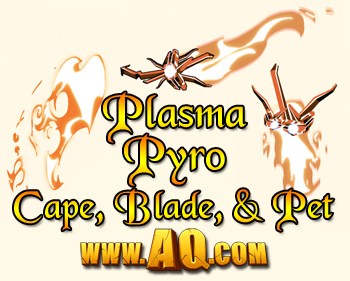 Thank you for the first 5 years of AQWorlds, and here's to another 5 years, 10 years, and beyond! Why hello! You know that the AQWorlds team does everything we can to keep your favorite online adventure game safe and fun for everyone—but just like Chaos Lords, there are bad people out there who want to ruin the experience. 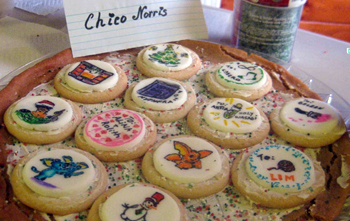 Do not mail us a letter via the postal service… instead, send cookies and love!! And there you have it! You now know everything about the AdventureQuest Worlds Reporting a Player System. Feel free to buff your INTELLECT Stats further by reading the Player Safety & Account Security here. Sad News for AQW's Art-Lovers! We wish him the very best in the future, and it's very possible that we may work with him again. 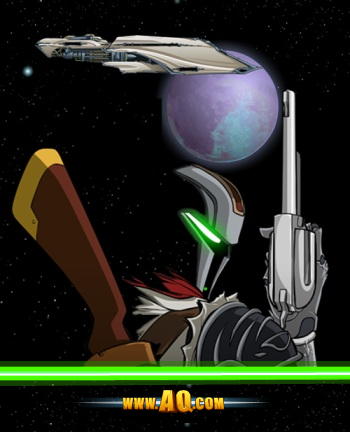 Both Solrac and the AQWorlds team know that the door is always open for him to return at some point. We know that he will rock out wherever he goes, and whatever project he takes on next! We hate to see him go, and gave him a thank you gift to show our appreciation. What the future holds for AQW's cybernetic artist, we don't know at this time, but we do know that everything happens for a reason, and that he'll bring all of his sweet art skills AND his love for candy with him. * We have another artist moving to full-time to take over those responsibilities, so you will not see a drop in the number or quality of release content. 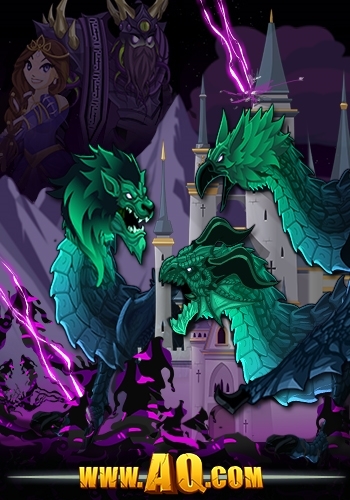 Log in Friday to take on the 3-headed Chaos Dragon AND confront Chaos King Alteon in the 12th Chaos Saga finale! Will you slay Chaos King Alteon... or spare him? And what will be the cost of your decision? As Swordhaven falls, Chaos flames rise high; life in Swordhaven will NEVER be the same! After that, the final confrontation will begin. 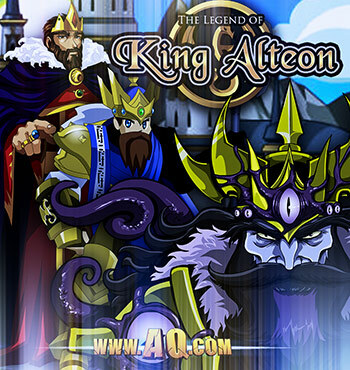 Will you save Chaos King Alteon, or will you slay him? And can you live with yourself once that choice is made? This week is the beginning of the end of the 13 Lords of Chaos Saga! From here, we move into Xing and Xang's Chaos Beast and Chaos Lord battles, then... into the heart of the Chaos Realm itself! AQWorlds 5th Birthday Gift: 200 Free ACs! Thank you for playing AQWorlds! Guilds Phase II PTR badge arrives tomorrow! Now that Yorumi is back from vacation AND healthy, we're moving onto some delayed projects. The Guilds Phase II PTR badge (and the Guild City Founder Statue) will be awarded to ALL players in a Guild created during the PTR at midnight tonight. (They will appear in the Book of Lore immediately, then on character pages tomorrow.) The servers should only need to shut down for 5-10 minutes. Cross your fingers! Thank you for founding your Guild City during PTR! Work on the Oracle Class, the reward for getting 1 million Likes on Facebook, is almost complete! We've got art, now we just need to finalize the skills, then we'll get that out to you all! Stay tuned for more news on later this week. Oracle Class: 0ACs for ALL players! 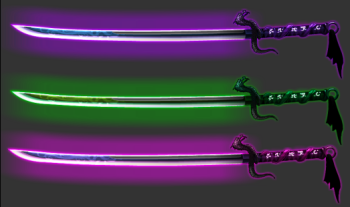 Last week, Dage made some amazing, technicolor Dragon Ninja Katanas for the Wheel of Doom and Destiny! These blades will drop from 1 of the Wheels for a limited time (1 full month) starting this Friday! Let the glow move you... into battle! Tomix's SoulWeaver armor is coming to AQW as soon as he has time to make the female armor. The female BrutalCorn armor will arrive as soon as Memet finishes making the art for the ChronoCommander Calendar Class! The earnable version of the Dragon Shinobi armor will arrive today. Yorumi and I will meet tomorrow to finalize our plan for the new anti-botting system. We are most in need of moderators who are bilingual (or more) in English and one of the following languages: Tagalog, Portuguese, Spanish. We will consider applications from people who only speak English, though! 7. A cover letter describing yourself, and what you think being a mod will mean. Please send your COMPLETE application to beamod@battleon.com by Friday, October 25, 2013. If the application is not complete, we won't consider it. And please, one application per person. We will read all the applications. If you are chosen to go through a further interview, we will contact you. Unfortunately, we cannot reply to everyone. * Note: please do not email applications to join Player Support, become an Artist or Dev. We are only looking for new in-game moderators, but we love how eager you are to help us and your fellow players! Post-script from Alina: Not sure what the difference between a Mod, Dev, and Tester is? Check out Cysero's handy breakdown of the different tasks each role performs. AE Ninjas vs Ultra BrutalCorn! Dragon Ninjas vs Ultra BrutalCorn! Login NOW to save the Underground Lab from a beatdown by ULTRA BRUTALCORN! The continuation of BattleCon 2013: an in-game convention continues this Friday with an expansion to the Secret Underground Lab map. Normally the SUL is invaded by ninjas or zombies roughly every couple weeks. We know how to handle those attacks. NOT THIS WEEK! Something is hiding in the shadows of the Room of Gloom, racing through the Soundbooth of Horrors, shattering windows and dreams with well-placed blows of his hind hooves. This is Beleen's "oh no BrutalCorn" face. Avoid ambushes by BrutalCorn and the Invisible Imposter Guard Ninjas! Help Artix the WindowSlayer take out all of the OTHER windows! Knock out the Green Screamers in the Green Room! Battle through the Soundbooth of Horrors! Clean out the Skeletons in our Server Closet! Take on Ultra BrutalCorn in the Room of Gloom! 5th Birthday Class: Dragon Shinobi! 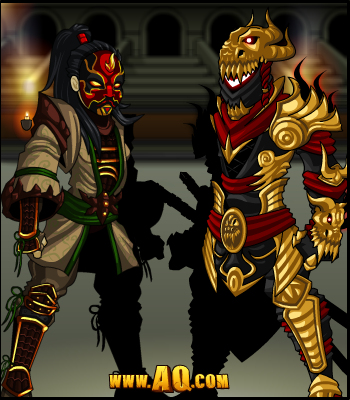 You can buy the Dragon Shinobi class from Ragnar in Battleon for 2,000 AdventureCoins until the class goes rare around our NEXT Birthday. However, until the birthday event rares leave, you will be able to EARN the class and all the extras completely free and all you have to do is help clear all these monsters out of the Lab and BattleCon! Alina will give you the quests you need to earn the class and also has the merge shop where you can buy them. Legends can access a daily quest which will let them earn triple the number of tokens, but with a little effort, everyone can earn the class before it leaves! Who's our favorite Dragon Shinobi? YOU ARE! Just REMEMBER, the chance to earn the class is a special bonus for those of you who were here to help celebrate AQW's 5th birthday and AE's 11th anniversary! Once the birthday event rare gear leaves on November 18th, you will no longer be able to earn the class. But 1 month should be PLENTY of time for anyone to earn it. You will need to turn in the quests and re-accept them every time. We've been forced to take this measure to help combat botters so you can thank those people if you find that a little annoying. It wouldn't be a party without presents! The monsters in the Lab will be dropping permanently-available gear, and you'll find the Birthday Present rares shop when you talk to Artix! Much of this year's birthday gear is based on the Shinobi and Ninja culture to celebrate Artix's appearance on America Ninja Warrior, and because so many of us have read The Book of War andThe Book of Five Rings. BattleCon 2013 and other updates! We haven't forgotten BattleCon 2013: an in-game convention... or that today is Canada's Thanksgiving! Happy Turkey-day, Canadians! 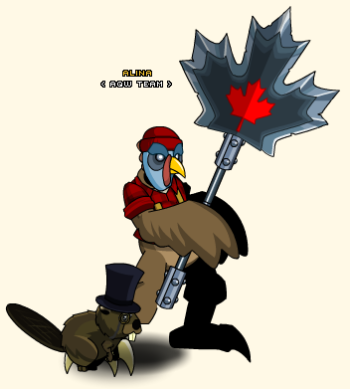 The Canada Thanksgiving Day shop will remain in-game until next Monday, October 21st. The shops for Beleen, Memet, and BattleGems have all been updated. Veneeria's shop will be added once we know the release is bug-free. The Livestream shop will leave Friday, November 1st. More details on HeroMart gear will be added. The "pet of the random month" is in production! Tomix's armor will come soon. He did not have time to create a female version this week due to the AWESOME DragonFable release! The BrutalCorn Character Page badge will be added to all those who should have it on Monday. Starsword hilt recolors are live! Find them in the shops attached to your Upholder badge. Dumoose is still working on the design for the Oracle Class. Stay tuned for more details on the Mogloween challenge fight and rewards! Guild PTR badges will be awarded once Yorumi returns from being sick. J6 is going to Space Academy! You guys made it happen! THANKS! 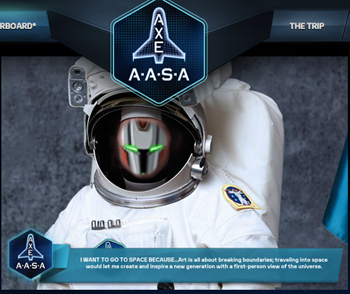 Thanks to ALL of you who voted for J6, he won the Axe Apollo contest for a chance to go into space! Through working together, you've all helped to send our Bountyhunter on the first step of his greatest journey yet: up where he belongs, among the stars! J6 says: A big thanks to everyone who voted to help send me to space. I got word that I made it to the finals, which means I'm heading off to Orlando in December to fly a fighter jet, throw up in zero G training and pass out in a centrifuge. Science! Why does he want to go into space? If J6 takes that big step for J6-kind up into space, when he returns, we'll have the astronomically-awesome thank you shop EVER! For many of our players, AQWorlds is the first online game they've ever played. A lot of them don't know what a "bot" or "trainer" is, and don't understand that using quest, shop, or badge loaders is wrong. It is, and you shouldn't do that. 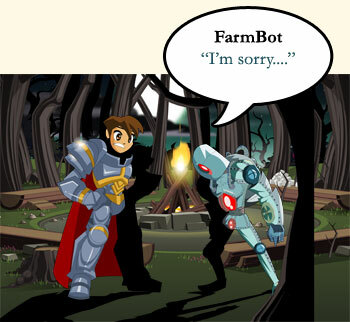 We explain what a bot is and why using it is bad in this Design Notes post. Do not tell a bot to play for you. Recently, some players have illegally given themselves the BrutalCorn badge from tomorrow's release. Because we have not yet been able to implement some of the ideas listed above, those players have received a 24 hour ban. * That's why, if you're currently using a bot, trainer, or any other 3rd party program, this is a GREAT time to stop! We all make mistakes; I have, and so has everyone I know. But that's part of life. Most people are able to move beyond them. They grow and change over time, and part of that growing is realizing when you're doing something dumb. Sometimes, though, people need a little help seeing that. At Artix Entertainment, we believe that people are basically good and, given the chance, most will do what's right. Or, at the very least, stop doing what's wrong. We want you guys to enjoy AQW. Play right and play fair. Have a good time in the game, and don't keep others from doing the same. We've gotten a lot of messages about NOT giving botters - or anyone who breaks ANY rules - a second chance. Permanent ban first time out. For anything. We could do that, but we would run out of players pretty quickly. We understand that you guys LOVE this game, and want to see people following the rules. We want that, too! But we believe in second chances. If you assume someone is going to fail, they're much more likely to do just that. I would rather give someone a chance to succeed than prevent them from trying to become better. We've got a plan in place to do that; now we just need to build it! Derp, Derp, Derpa de durp, hurp. Derp. Ohai there! 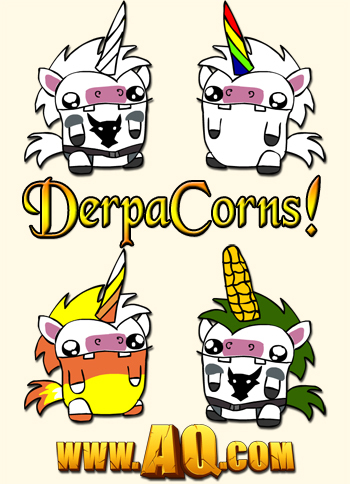 All my friends on Twitter have been BEGGING me to take BrutalCorn to the Derp Side. Well, well, well, what do we have huuurrr? What's better than ninjas? Dragon ninjas. Dragon Shinobi! During our 5th Birthday event, you'll be able to earn this class by helping Artix save BattleCon (and the Underground Lab!) from a monster invsion. After the event ends, you'll still be able to buy it from Ragnar in Battleon. The class will be in game until our 6th birthday, at which point it will go rare. 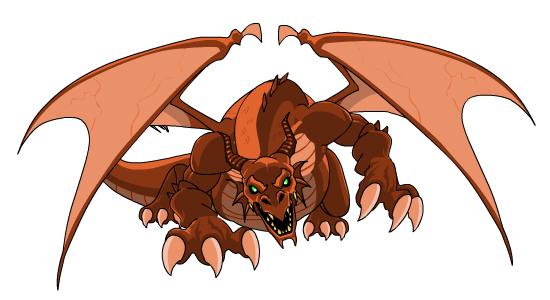 To earn Dragon Shinobi, find Artix at the underground lab. Complete quests for him to earn Dragon Shinobi tokens, and then merge the tokens into class set items at his Dragon Shinobi merge shop. Just like last year, you'll have a month to earn the tokens you need. After that time, the only way to get these items will be to buy them. You should be able to earn enough tokens pretty easily though, since the quests can be repeated as often as you want. Plus there's an extra quest for Legends, so if you have a membership it will go even faster. Ninjas are hailed for their dexterity. Dragons are praised for their strength. And when the Ninja trains in the way of the Dragon, they shall become the Dragon Shinobi, master of brutal warfare! Dragon Shinobi have mastered the most effective ways of disabling their opponents while enduring their strikes. Dragon Shinobi was designed as the evolved version of last year's Chunin class. Unlike Chunin, which was a brute force, multi-target sort of ninja, Dragon Shinobi focuses all of its damage onto a single target. Its damage is based on stackable DoTs, so it starts out slow and then ramps up the damage as the fight continues. And for a little something extra: you'll regen mana whenever you hit an enemy, and you'll regen both mana and HP whenever you dodge an attack. "It's all about strategy with this class." "It's a pretty powerful and tactical class." "I soloed Desoloth with it, the one from the war... [though it] required patience." Excited yet? Well, then you must be ready for a detailed skills breakdown! 10 mana, 3 second cooldown. Requires rank 1. Throw a deadly shadow poison tipped shuriken at your target. Shadow Shuriken will continually damage your opponent from afar. Each throw not only increases the shadow poison's damage but also has a small chance to apply Spinning Dragon to reduce your target's next hit to 0 damage. Single-target DoT. Since the damage effect stacks, go ahead and use this skill whenever the cooldown comes up. The chance for Spinning Dragon is even more of a reason to use this skill as often as possible. 90 mana, 2 second cooldown. Requires rank 2. Focus all your chi into restoring your life force. Since this uses almost all of your mana, you'll have to be strategic with this ability despite its short cooldown. However, it is a FULL heal. 15 mana, 52 second cooldown. Requires rank 3. Meditate, transferring yourself into the shadow realm to restore your mana. While meditating, you cannot attack for 7 seconds, and all attacks against you will deal greatly reduced damage. This basically stuns you for 7 seconds (during which time you take a lot less damage), but it heals a large chunk of your mana. A cunning player could use this in conjunction with Chi Heal quite effectively. Note that using this ability will clear out your Shadow Shuriken damage stacks. Increases haste by 10%, and Damage Over Time effects are 30% stronger. 30 mana, 8 second cooldown. Requires rank 5. Hit your opponent with a flaming strike for moderate damage to burn your target over time. This attack has a chance to apply Spinning Dragon to reduce your target's next hit to 0 damage. This one isn't stackable, but it is a stronger attack than Shadow Shuriken, so it's a good supplement for it. Gives a small chance per attack to gain the power of the Shadow Dragon increasing the power of all Damage Over Time effects by 400% for 20 seconds. This sounds more OP than it actually is. But it's still a really nice bonus for those longer fights. So, there you have it! The perfect single-target complement to Chunin's multi-target awesomeness. Strength and dexterity are definitely your friends with this class, so be sure to choose your enhancements wisely . Have fun! Edit: Shadow Soul no longer heals all of your mana; it brings it up to 65. Breakdown edited accordingly. Make Sure to Use the Help Pages! Player Support is the first line of defense whenever you have ANY issue, be it payment, account, technical, or game-related, and we personally read EVERY email sent to us. We’re a small team, but we are MIGHTY in our power to help solve your problems and make sure you enjoy our games as much as possible! Where Else to Get Help? You should only email the Help Pages! For us to help you in the best and fastest way possible, we NEED you to use them, not Twitter, Facebook, or the forum! Where ARE the Help Pages? You can find them linked on each of our game websites! There’s nothing I enjoy less than a stolen account. I’m sure you feel the same way - who wouldn’t?! So here are some tips to help keep your account safe and out of the hands of thieves. Never share your account with anyone! Not even a friend. Every person who knows your password makes your account less secure. Use a secure password! Use oth letters AND numbers, use both upper and lower case, and make sure your password is at least 8 characters long. Confirm your email with us! This makes sure your email can’t be changed without your permission. Never enter your account name and/or password into any site or email that isn’t owned by Artix Entertainment! We Don't Want to Ban or Mute You! We have rules in place to help keep ALL our players safe and having fun in AQWorlds! Make sure you follow the rules so you don't have your account muted, banned, or disabled! Not sure if something's ok to do? Review the rules! 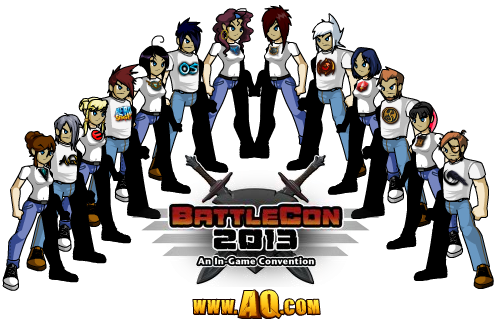 Event Schedule for BattleCon 2013: an in-game convention! Get your BattleCon on! Have you visited BattleCon yet? If not, /join battlecon to experience the first-ever in-game convention: meet your fellow heroes and the AE team members, learn about all of our games, and get epic cosplay-themed gear! 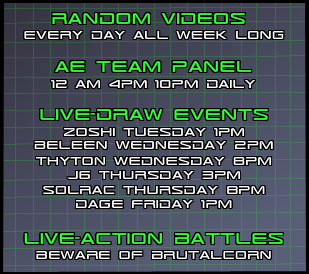 *event schedule subject to random attacks by BrutalCorn. 3 PM: 2 hour Virtual Panel with members of the AE team! 12 AM: 2 hour Virtual Panel with members of the AE team! 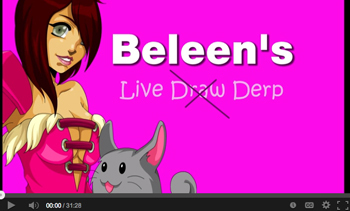 2 PM: How to Draw Derp with Beleen! 4 PM: 2 hour Virtual Panel with members of the AE team! 10 PM: 2 hour Virtual Panel with members of the AE team! 7 PM: 5th birthday event: Dragon Ninjas vs BrutalCorn! 11 PM: 2 hour Virtual Panel with members of the AE team! BattleCon 2013: an in-game convention continues this Friday with an expansion to the Secret Underground Lab map! Normally the SUL (secret underground lab) where Artix Entertainment games are made are invaded by ninjas or zombies roughly every couple weeks. We know how to handle those attacks. This is not the Ultra BrutalCorn you will face. 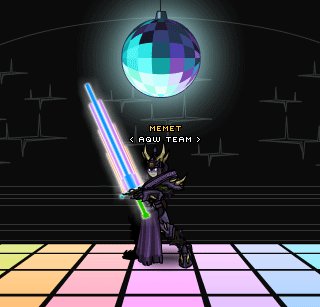 Artix will give you the quests you need to earn the class and also has the merge shop where you can buy them. Legends can access a daily quest which will let them earn triple the number of tokens, but with a little effort, everyone can earn the class before it leaves! Much of this year's birthday gear is based on the Shinobi and Ninja culture to celebrate Artix's appearance on America Ninja Warrior, and because so many of us have read The Book of War and The Book of Five Rings. The shops for Dage, Beleen, Memet, and BattleGems will all get updates. Veneeria's shop will be added. Starsword hilt recolors are coming soon. We have removed the BrutalCorn badge from character pages. We will look more into this issue when Yorumi returns from vacation later this week. We are in final testing of the item deletion/stack bug. That should roll later this week. Guild PTR badges will be awarded once Yorumi returns. One of the best parts about hanging out at Con with your friends is picking up souvenirs and awesome items that just look, well, really COOL! And BattleCon 2013, our in-game convention, is no different: we've got a TON of gear for you to check out. Some of it will go rare once the event ends, but much of it will stay in-game (along with the maps, monsters, and cutscenes) forever! /Cheer for gear from your favorite AE games! Get your BattleCon on with epic cosplay gear! 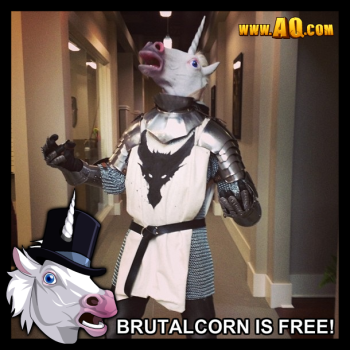 Play the part as you battle BrutalCorn, conrot, and Cosplay Zombies! Two of our (not-quite-over-9000) items! 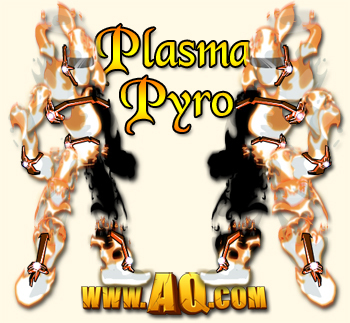 Created by the AQWorlds' artists for our favorite hero: you! 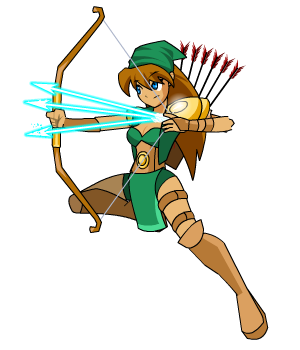 Birthday theme: Artix Entertainment Ninjas! Selected by Hollow, head of AdventureQuest, to showcase the awesome gear found throughout the original AQ! 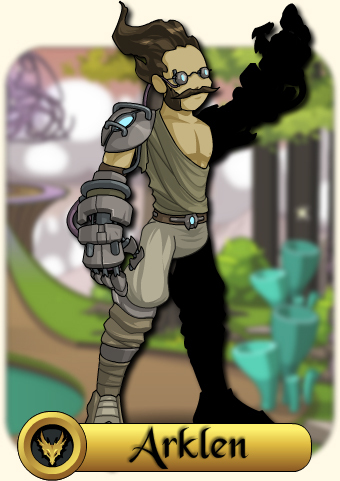 Rock your AQWorld with gear from DragonFable, selected by Tomix the SoulWeaver! 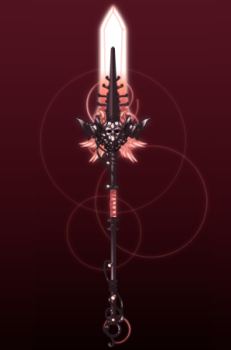 Gloom Glaive, handpicked by Tomix for DF's shop! Tomix's armor coming next week! Handpicked by Maegwyn, head of MechQuest, this galactic gear includes art by Minar and Bladebrawl! 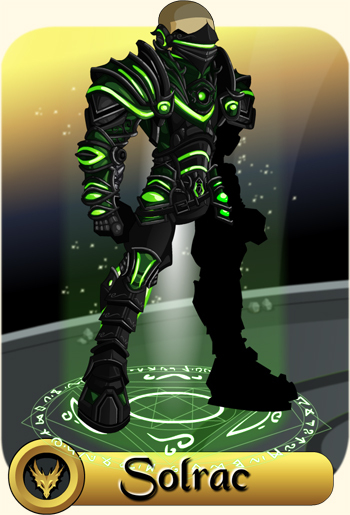 NightWraith, creative lead of EpicDuel, knows that /equipping any of this gear will make you a much cooler Dueler in AQW! PvP to the Vth power! Calling all heroes AND villains! Smash your way through battle with gear straight from Randor's computer to YOUR backpack! You won't get over how awesome this gear is anytime soon! Created by Nulgath and his artistic apprentice, Revontheus, you'll be soul'd on every item they've got! Chairman Platinum says you'll take what he's got to give and love it. What the Chairman says goes, right? 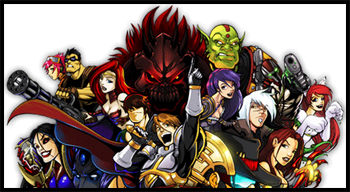 Artix, Cysero, Yergen, and the crew have been hard at work prepping BattleGems for launch. We have a full BattleGems shop planned for release soon. Until then, keep an eye out for a new staff (and maybe some other gear) this coming week! Kraken, head of the Dragon's Bane team, knows that once you see what his team has in store for your tablet and cellphone, you'll be ready pick up the blade and head off into the 3rd dimension! 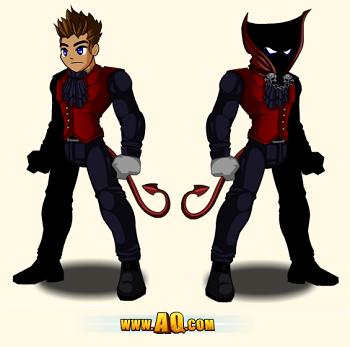 The shops in our Featured Artist Alley contain gear by individual AQW artists. When we began the Featured Artist shop series, we planned to have them cycle in and out of availability, bringing the returning items AND new rare gear each time they appeared. Our artists LOVE creating gear for you! Now that they have a permanent home in BattleCon 2013: an in-game convention, the Featured Artist Shops will remain there with each shops' permanent gear. As we cycle the shops in and out over the coming months and years, the new gear they create will be a mix of rare and permanent content, with the non-rare items going into the Artist Alley shops. The Dage and Nulgath Artist Alley shops WILL get permanently-available items in them; however, the gear currently in each shop WILL go rare once this event ends in a few weeks. 11th AE Anniversary / 5th AQW Birthday! This weekend, get your /party on at BattleCon 2013: an In-Game Convention, as we begin two weeks of the most brutal and battle-tastic double-celebration ever! The only way we can meet ALL of the heroes who make our games possible is inside AQWorlds, so we’ve pulled in team members from ALL our games to create the most EPIC in-game convention EVER! If you can't come meet the AE team in person at the conventions we attend in real life, join us in AQWorlds for BattleCon: the all-staff, all-player in-game convention... and all the con-swag you can handle! Super Kathool and Doctor What armor sets! Meet members of the AE team! Get your badge signed by all the AE team members! Get your Rave, Rave, Rave on in the Timezard's Ballroom! Rock out at the first virtual Con Artix Entertainment's ever held! There's always a TON of things to do at conventions, so make sure you hit ALL the booths AND the artist tables AND the rave AND the Cosplay Zombie Parade! Vendetta Vampire and Kakarotting armor sets! Lore's most brutal boss battle! Live-action tournament of Cosplay Champions! Live-draws and video tutorials from AE artists! Q&A session with Beleen and Kityana! Our favorite videos play throughout the day all week long! Vendor booths with gear from other AE games! Artist Alley - shops from your favorite AQW artists! Return of the Secret Underground Lab! Rave about the epic /dance party! Anniversary? Awesome! What about the Birthday? October is the month of OMG-SO-MANY-PARTIES! With AE's anniversary and AQW's birthday falling so close together, we're combining the events into one ginormous celebration... but with double (or triple?!?!) the number of rewards and quests! 5 Rings Warrior and AE Dragon Ninja sets! After you've explored the Coliseum, head down the elevator into the Secret Underground Lab! This map, which we released last year, is returning and will become a permanent part of the game (but without the rare gear from last year). Explore a (mostly) true-to-life version of the Lab this week, then return NEXT Friday to battle through the expanded version with all NEW birthday rares! Flash's memory refusing to cooperate as we prepared to go live. This event is BIG. We've got a LOT of games and a LOT of fun stuff, and we didn't want to leave anyone out. But it got to be SO big that Flash said "nuh uh. I don't care HOW much you want to enjoy the event. Not gonna do it." So we sat down and made some modifications to how it handled its memory and voila! We were able to compile the file and get back to getting our party on! SO Much Con Swag and Merch! One of our favorite parts about going to Con is seeing all the Vendors, the merch they sell, and the artist's alley full of amazing artwork. So of course OUR Con had to have the same! FIVE StarPony sets to help you "use the horse"! That's why we've got gear from ALL our games in the convention, and most of this gear - and the event itself, will NOT go rare! Void Dragon Rider Armor at Nulgath's Table! Each of the game shops will feature staff and player favorite art straight from our other games! 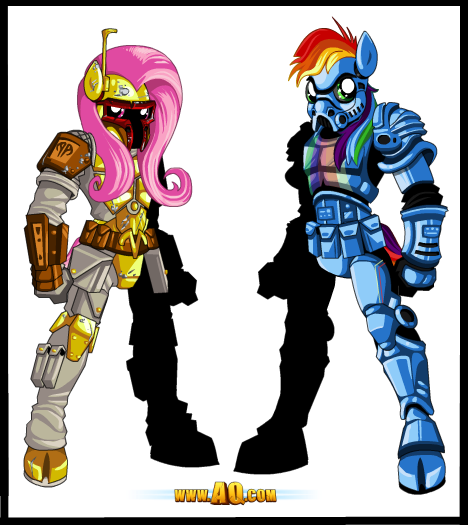 For the Cosplay gear in the AQW shop, we've created mashups of our favorite pop-culture phenomenons and turned them into armors just for you! We call our players the “friends we have never met” for a good reason: because you are awesome! We would genuinely love to meet and hang out with all of you in real life, because we were all just like you guys at one point: we loved videogames, art, stories, and all of the crazy things that make everyone a hero in their own dreams. 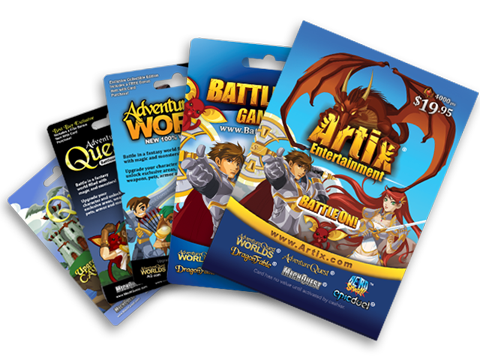 It's thanks to YOU that Artix Entertainment has been able to keep making games for the last 11 years, and that AQWorlds has been online for 5. We aren't going ANYWHERE, and we hope you'll battle alongside us as we adventure across new in-game continents and into new real-life platforms and dimensions! Our games are really YOUR games! And if YOU have a passion for art, writing, or programming like the members of the AE team do, do what you love as often as you can! Maybe someday you'll be standing alongside us at BattleCon, too! You DID IT! Thank you to everyone who helped! WOW! 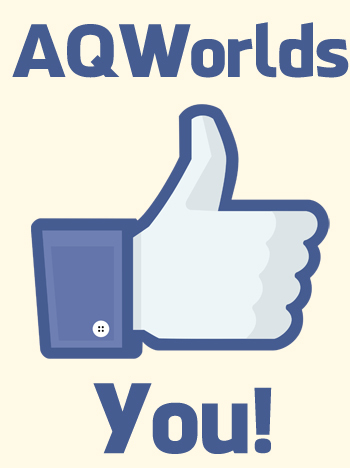 1 million Likes on the AQWorlds Facebook page! You guys are AMAZING, and this is absolutely YOUR victory! When we work together, there is nothing we can't do! AQWorlds likes YOU x 1,000,000! Stay tuned to the Design Notes early next week for more details about the Oracle Class, which ALL players will get for FREE (with 0 ACs for permanent storage) as soon as we finish testing it!